Wu Suk Ching (center) and Song Zhiyong, President of Air China cut a cake at the China-overseas Joint Venture 001 Achievements Ceremony on January 10 in Beijing. Enjoying a "feast" on a plane is not a big deal for many Chinese with the improving living standards, but for the air catering companies, providing a delicious and safe meal high up the sky has never been as easy as it looks, and also requires special technology. In a bid to ensure flight safety, food on a plane, especially cooked food, must go through a complicated delivery process, being transferred in special carts on planes, and reheated before they can finally be presented to the passengers. Western buffet would be easier to make than Chinese cuisine, and needs less technology. But even a simple food category like bread was once a headache for domestic air catering companies 40 years ago. Known as "China-overseas joint venture 001," Beijing Air Catering Co's development might reflect how backward China's air catering industry was, and how rapidly it caught up with the global standards over the 40 years of China's reform and opening-up. The aviation food company, with about 3,000 employees and annual revenues of over 1.1 billion yuan ($140 million), now provides food for 40 domestic and foreign airlines operating at Beijing Capital International Airport. Almost 40 million passengers taste the food they produce each year, according to the note Beijing Air Catering sent to the Global Times. In December 1978, China decided to launch the significant move of reform and opening-up. Firms from Japan and Switzerland first saw the business opportunity in China' aviation food industry. However, their stringent requirements forced China to refuse their offer of cooperation. It was then that Hong Kong entrepreneur James Tak Wu, and his daughter Annie Wu Suk Ching, grasped the opportunity and devoted themselves to establish the first China-overseas joint venture, said the note. In April 1980, the central government officially approved the establishment of Beijing Air Catering Co, with Beijing Administration of Civil Aviation of China holding 51 percent of the share, while the Hong Kong company held the remaining 49 percent. This also marked the start of the development of overseas-funded enterprises, with Beijing Jianguo Hotel, Schindler, Dynasty Winery and many others following in the footsteps of China-overseas joint venture 001. By the end of 1985, Beijing had approved 8,355 overseas-funded enterprises. In the first half of 2018, about 30,000 such companies were set up across China, according to a report from the Xinhua News Agency. After years of development and experience, Beijing Catering Co is now seeking a leading position in the Asian or even the world's aviation food market. The company's turnover increased by more than 26 times as of the end of 1987, and could provide more than 600 types of meal, with 45 percent being western cuisine. The company has remained profitable since its establishment in 1980, according to the overseas edition of People's Daily. 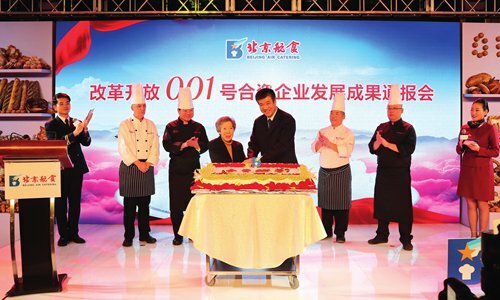 Facing increasing competition in the domestic market, as well as the international market, Wu Suk Ching told the Global Times that she will continue to cooperate with Air China, to improve food quality, and "do what they have to do" in the future to become a global model for a "standard international air catering company." The company's strong growth also came alongside the growth of China's aviation industry. In 2017, the annual aviation passenger traffic in China reached 549 million compared to the 3.43 million in 1980. The rapid growth also indicates the huge market demand for air food, according to the data from Civil Aviation Administration of China (CAAC). At present, China has more than 130 air food companies, as well as thousands of suppliers, providing air meals for 135 foreign airlines, and more than 40 domestic airlines, according to the note. Moreover, although initially developed following the international style, China's aviation food industry has gradually formed its own characteristics featuring a wide variety of Chinese cuisine covering diverse tastes. Echoing the development of China's aviation food industry, Chinese people's demands and understanding of air food has also been changing. Passengers are demanding a "tasty meal" rather than just a "full meal." In-flight meals have become a competitive issue for Chinese airlines, in order to attract new passengers. On December 23, 2017, China implemented the first regulations and rules for the aviation food industry, to better regulate the domestic air catering industry, thus marking another new era for the country's rising air food catering sector. 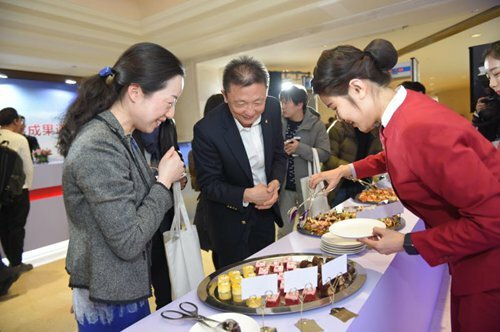 Jiang Junxian, president of China's Cuisine Association, noted that the growth of China's catering industry has maintained a reasonable and consistent growth rate, predicting that the revenues of the industry will reach over 5 trillion yuan in 2020, CAAC news reported.